BIG SALE!! 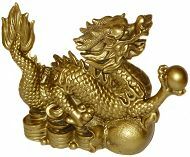 FENG SHUI DRAGON FIGURINES BIG SALE!! Beautiful clear glass Chinese Dragon with ruby crystal accents and gold trimmed horns, back and claws. He stands on an oval beveled mirror base. 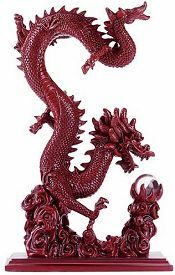 Feng Shui accessory combining the beneficial properties of the ancient dragon symbol with the Chi energy of mirror and glass. Coiled in serpentine splendor, this fabulous Millennium Chinese Dragon figurines represents the full release of Kundalini energy, believed to be the unseen energy of the body. Hong Tze stone resin sculpture with a highly polished Rosewood finish. Coiled in serpentine splendor, this fabulous Millennium Chinese Dragon represents the full release of Kundalini energy, believed to be the unseen energy of the body. Hong Tse stone resin sculpture in Antique Gold satin finish. Tall coiled Chinese Dragon with 40mm crystal ball. Chinese Dragons are legendary for their strength, power, and fearlessness. The dragon is the 5th year of the Chinese Zodiac 12 year cycle, the last being 2012. Hong Tse stone resin sculpture with a highly polished rosewood finish, includes a removable 40mm crystal ball. 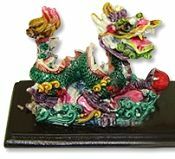 16 1/2" H x 10" W x 6"
Gold Chinese Sea Dragon figurine riding turbulent ocean waves, superbly creates the illusion of the alchemy of unified Fire and Water. This dragon is best placed in the living room, study or office in the East or Southeast corner. Hong Tse stone resin sculpture with a polished antique gold finish. 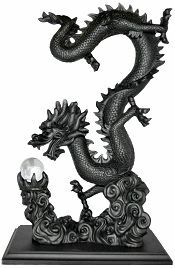 Tall coiled Black Chinese Dragon with 40mm crystal ball. Chinese Dragons are legendary for their strength, power, and fearlessness. The dragon is the 5th year of the Chinese Zodiac 12 year cycle, the last being 2012. Hong Tse stone resin sculpture with a beautiful satin Black finish, includes a removable 40mm crystal ball.